(see Gorki) Gorki is a poetic yet powerful Dutch-singing group from Ghent, Belgium. They originally operated under the name of Gorky (with a ?y?) but slightly changed their name when frontman Luc De Vos reformed the band in 1992. As many Belgian bands, Gorky rose to the attention of the crowd during Humo's Rock Rally. They finished third in the edition of 1990, enough to gain record company interest. Gorki is a poetic yet powerful Dutch-singing group from Ghent, Belgium. They originally operated under the name of Gorky (with a ?y?) but slightly changed their name when frontman Luc De Vos reformed the band in 1992. As many Belgian bands, Gorky rose to the attention of the crowd during Humo's Rock Rally. They finished third in the edition of 1990, enough to gain record company interest. Together with producer Wouter Van Belle, they recorded their self-titled debut album, which was intimistic and powerful at the same time. Singer Luc De Vos managed to write very personal yet recognizable lyrics filled with imaginative imagery. Not less than five singles were taken from the album. Songs such as ?Lieve kleine Piranha? and especially ?Mia? remain very popular up till today. In 1992 the band recorded a semi-acoustic album ?Boterhammen? in a park in Brussels. This was a series of intimistic concerts held every Friday during summer, an initiative by the Ancienne Belgique called ?Boterhammen in het park'. This album features guest performances of Rick De Leeuw, singer of the Dutch group Tr?ckener Kecks and guitarist Patrick Riguelle (see Riguelle & Hautekiet, Kadril). 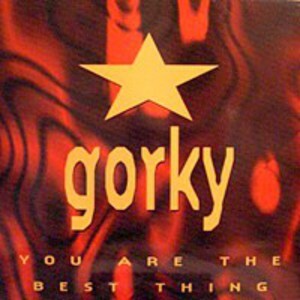 This album becomes the last act of the group Gorky. Soon afterwards Luc De Vos reforms the band and the record company insists it would be called Gorki (with an ?i?). Together with old-timer Sylvain Van Holme (a.o. Two Man Sound) the new band moves to Dakar in Senegal to go record the album ?Hij leeft? in the Xippi studios of Youssou N'Dour. The album is much more subtle than the older products of Gorki ?which makes the melodies and the superior lyrics of De Vos sound even better? (Oor). The album achieves a gold status in Belgium and 3 singles are released. 1994 and 1995 are a lot more quiet for the group. Luc De Vos goes literary and becomes a columnist for leading Flemish newspaper ?De Standaard? and radio station ?Studio Brussel?. In 1995 the group bivouac in the ICP-studios in Brussels together with Jo Bogaert (the man behind Technotronic) to record their fourth album entitled ?Monstertje? (Little monster). Record company Virgin initially refused the mix Bogaert had made in his home studio, so the album is remixed for a second time. Singles from the album are ?Lang zullen ze leven? (Long will they live - For they are jolly good fellows), ?Monstertje? (Little monster) and ?Kom me toch halen? (Come and get me). Gorky can also refer to one of the most influential Russian writers. Gorky was born in Nizhny Novgorod and became an orphan at the age of ten. In 1880, at the age of twelve, he ran away from home in an effort to find his grandmother. Gorky was brought up by his grandmother, an excellent storyteller. Her death deeply affected him, and after an attempt at suicide in December 1887, he travelled on foot across the Russian Empire for five years, changing jobs and accumulating impressions used later in his writing. As a journalist working in provincial newspapers, he wrote under the pseudonym ???????? ??????? (Jehudiel Khlamida? suggestive of ?cloak-and-dagger? by the similarity to the Greek chlamys, ?cloak?). He began using the pseudonym Gorky (literally ?bitter?) in 1892, while working in Tiflis newspaper ?????? (The Caucasus). The name reflected his simmering anger about life in Russia and a determination to speak the bitter truth. Gorky's first book ?????? ? ???????? (Essays and Stories) in 1898 enjoyed a sensational success and his career as a writer began. Gorky wrote incessantly, viewing literature less as an aesthetic practice (though he worked hard on style and form) than as a moral and political act that could change the world. He described the lives of people in the lowest strata and on the margins of society, revealing their hardships, humiliations, and brutalization, but also their inward spark of humanity.